It happened once upon a time…back a couple years ago when I was instructed by my doctor to adopt a gluten-free diet. I attempted, from scratch, to make banana bread. And…it failed. Miserably. It was dense, heavy, and…WET! And I disliked it enough to throw it away. And from that moment on…I never attempted it again. Never. I designated any over-ripe bananas to another cause. And then, while out shopping one afternoon and randomly stopping into a Home Goods store, I stumbled across their gourmet food section. Danger, Gluten-Free Will Robinson, Danger!! They actually had quite a good selection of gluten-free foods and products. And I…just had to try them. 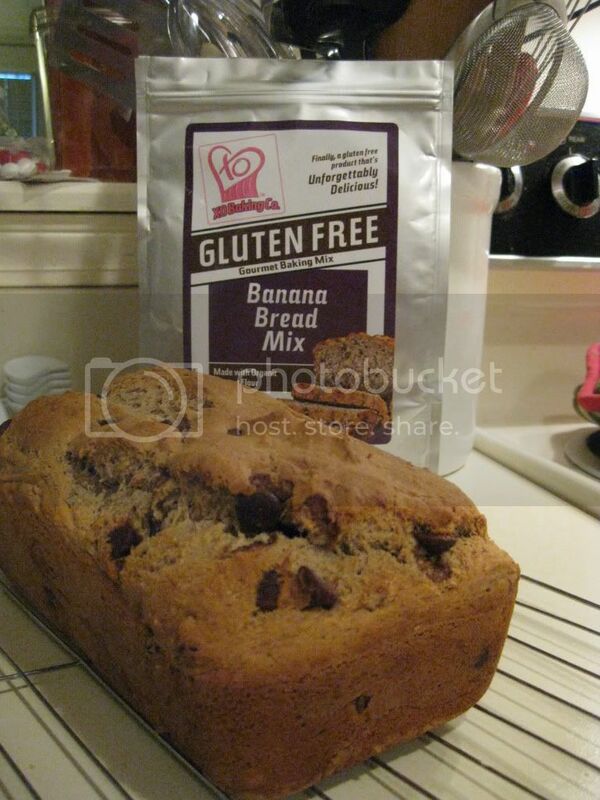 The one that seriously caught my eye, however, was the XO Baking Co’s Banana Bread Mix. I mean…it had been forever since I had had good banana bread. I was craving. For real! So, it and a few other items made their way into a basket I ran back to the door to get and soon I was checking out with a plethora of new gluten-free goodness. Or…at least I hoped. It was only then that I realized that I required three large overly-ripe bananas for the bread mix. DUH! I don’t know why I assumed this would magically taste like banana on its own. So, my roomie and I dashed back out to the grocery store. And NONE of the stores had any overly ripe bananas. In fact…they were all very green. I mean…GREEN! What to do? We finally discovered a couple at Target…but needed one more. So, we grabbed on that wasn’t quite as green as the rest and decided to just run with it. When you are handed under-ripe bananas…you attempt to do your best to make banana bread. Back at home, mixing this together was easy. I mashed the bananas then put them into my Kitchenaid mixer. To that, I added eggs, oil, and almond milk. That got beat together until just combined. Then, in went the bread mix straight from the package. A little more mixing and it was done. As I’m working on shrinking the amount of items in my pantry, I added the rest of the chopped pecans (about 1/2 cup) and then put in 1/4 cup of Reeses peanut butter chips and 1/4 cup chocolate chips. I folded these into the batter, poured them into the pan and baked for about an hour. The entire time it baked, I couldn’t help but return to the kitchen to steal another whiff of the bread. It smelled fantastic as it cooked up. And when it emerged, it was a beautiful golden color on the outside. I allowed it to cool in the pan before turning it out and setting it to cool the rest of the way. The big test came the following morning when I sliced it up to make some French toast with it. O.M.G. No…for real. I didn’t do anything fancy to the French toast batter. Just egg, a little light coconut milk, vanilla and cinnamon…dunked the bread and put it on my skillet. Flipped it once it got golden, then served it with a bit of hot maple syrup (homemade and delicious from my friend Erica). This bread is packed with flavor. Even done up as though it were French toast (which definitely was preferred to the usual gluten-free sandwich bread I use). The nuts, the peanut butter chips, and the chocolate chips really compliment that banana flavor. The texture isn’t too dense or heavy. In fact, it seemed perfect for this kind of loaf of bread. I was enamored with the variety of flavor that hit my palate. BUT…to be fair, I needed to taste it without dressing it up too much. So, the following morning, I just gave the bread a light toasting in the oven to warm it. Then a small schmear of vegan butter and a drizzle of honey…and BAM. Banana bread perfection. The sweet honey worked well with the nuts and different flavor chips that were baked in. Oh…this is a definite must have for your gluten-free pantry. If you can’t make a good banana bread from scratch, then you should totally give this mix a try. The guess work when it comes to what flour to use and how long to bake is taken out of the equation. This mix is created using a gluten-free flour blend (which includes cassava flour, unmodified potato starch, organic coconut flour, and xanthan gum). Brown sugar adds a nice hint of sweetness to it. Baking powder gives it that necessary lightness to rise, baking soda, sea salt, and organic vanilla flavor. That’s it. As for the nutrition standing…the mix contains 110 calories for 1/12 of the loaf. I went ahead and sliced mine into 12 slices so that I was certain of the servings when I began carving into it. That’s not bad. Not bad at all. This mix is also completely all natural, rice-free, trans fat free, gluten-free, wheat-free, and soy-free. And in the end, you are left with a delicious, moist, banana-flavored bread that you can dress up however you like or just leave with simply bananas. Any way you slice it…it is AMAZING! XO Baking Co. is off to a good start and winning me over already. This entry was posted in Bread, Breakfast, Chocolate, Food, Fruit, Gluten-Free, Mix, Nuts, Products, Review, Snacks, Sweet Stuff, Vegetarian by The Celiathlete. Bookmark the permalink. Thank you for such a great product. Looking forward to trying other mixes from XO Baking Company! !